Oct. 23, 2018 – For forest companies like TimberWest, the health of the trees and associated ecosystems are paramount. From seedling to maturity, the trees must be monitored, and any problems addressed. The way in which this monitoring happens is changing dramatically through the convergence of new sensing technologies such as LiDAR and the ability to deploy sensing technology using drones. What was once used only for air space and meteorological research, LiDAR – which stands for Light Detection and Ranging and is commonly referred to as airborne laser scanning – is now being used for forest research to more accurately examine everything from the height and diameter of trees to ground terrain evaluation and plot-level wood volume estimates. In the just-released video Forest for the Trees: How technology is transforming B.C.’s forest industry, University of British Columbia (UBC) forestry professor Dr. Nicholas Coops emphasizes LiDAR and drone use are just two more recent examples of the forest sector’s technological revolution, and the types of technology incorporated into every-day forest management. “This link between technology and forestry has always been there. I think now it just happens to be exploding at the moment,” Coops says. Coops explains LiDAR technology can be used with airplanes or drones and involves sending pulses of light down to the ground that bounce back and mirrors the data captured into images that allow forest planners to measure the topography, depth, height, slope and other values of the land being surveyed. 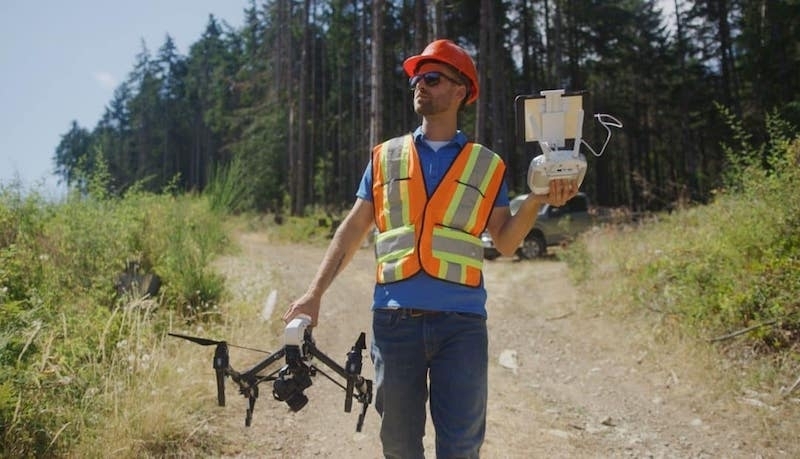 Domenico Iannidinardo, TimberWest’s vice-president of sustainability and chief forester, says he sees great value in LiDAR technology and drones when it comes to forest management and planning. LiDAR can provide a wide range of enhanced ecological applications such as evaluating microhabitat diversity and watershed modelling. Through the use of LiDAR, forest planners can rapidly and accurately produce three-dimensional data-sets, which allows them to better assess road building opportunities, stand value and wood quality, resulting in more efficient inventory management. UBC’s Faculty of Forestry Dean Dr. John Innes says he is convinced the industry’s integration and adoption of technology will only continue to build momentum in the future. To learn more about how technology is transforming British Columbia’s forest industry, click here. • Investment into new technologies is revolutionizing the way Canada’s forest industry does business. The federal government reports between 2005 and 2015, Canada’s forest industry cut its total energy use by 31 per cent and reduced its greenhouse gas emissions by 49 per cent by generating bioenergy from waste products and increasing energy efficiency. • British Columbia is breaking ground in tech-sector contributions. The province led the way in the development of the Digital Technology Supercluster, of which TimberWest was an early participant and founding member. As well, B.C. is reported to have the fastest growing tech workforce in Canada. • In 2015, B.C.’s tech sector revenue grew twice as fast as the Canadian average. • As a result of the sector’s growth, Vancouver is now ranked the top tech cluster in Canada and one of the top 15 tech clusters in the world, in terms of value per capita. Sources: Natural Resources Canada (NRCan) and B.C.-led Canadian Digital Technology Supercluster Strengths and Capabilities Deloitte Report. • Since the 1930s, more than 7.5 billion seedlings have been planted in B.C. • On average, over 200 million tree seedlings are planted annually on public forest land in B.C. • The total geographical area of B.C. is 95 million hectares. In British Columbia, less than one per cent of the province’s forests, equal to approximately 200,000 hectares, is harvested annually. • Canada is considered to be the international leader in forest certification with B.C. contributing more to these efforts than any other province.